England won by two runs as the final wicket partnership between Brett Lee and Michael Kasprowicz scored a remarkable 62. 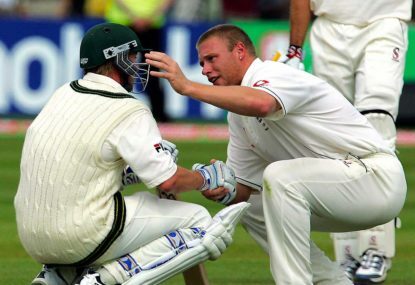 The image of an empathetic Andrew Flintoff consoling the unbeaten Lee after the final wicket went down is one that will be forever ingrained into the memories of cricket fanatics. It was one of the most thrilling and absorbing contests in Test match history. Amazingly, there hasn’t been a Test played at this famous venue since 2012, as the 2013 Ashes series did not hold a Test at Birmingham. Or when you think Edgbaston is it that famous World Cup semi-final in 1999 that spring to mind? Australia and South Africa have played out some of the greatest ODI matches ever seen, and this drawn match was one of them, as the Australians fortunately progressed through to a final they would ultimately win. My goodness this ground has witnessed some extraordinary scenes! The first time this special venue graced Test cricket was over 100 years ago, and the Australian side were bowled out for a mere 36! It’s the ground where West Indian legend Brian Lara amassed a phenomenal 501* for Warwickshire in a county match in 1994. England captain Alastair Cook flayed 294 against the Indians back in 2011 when his side were at the peak of their powers. Only three years ago we saw West Indian quick Tino Best pile on 95 batting at number 11, the highest score by a number 11 until Ashton Agar knocked him off his mantle, scoring 98 the following year at Trent Bridge. Edgbaston is a ground where miracles happen. It has housed some phenomenal cricket over a long stretch, especially in the last 20 years. And given that the third Test in this series will be the first at the venue since 2012, I am excited as to what unforgettable moments might be ahead.